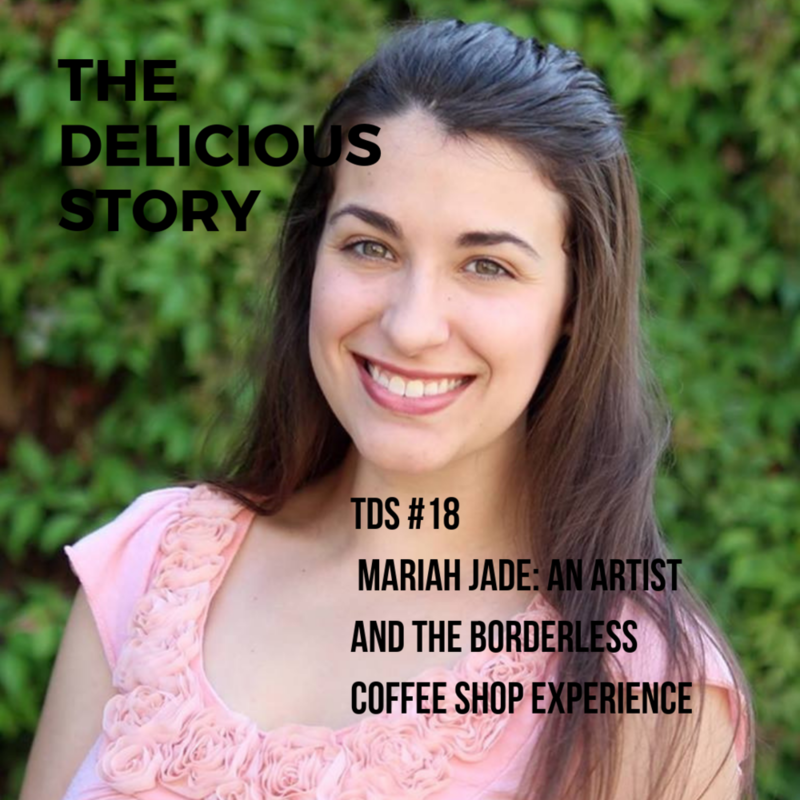 Listen to "TDS 18 MARIAH JADE ART AND THE BORDERLESS COFFEE SHOP" on Spreaker. I first knew Mariah Jade to be an artist and a person who splits her time between Mexico and the States. I also knew she works at the The Great Frame Up in West Des Moines, providing framing services and assisting with social media outreach. One new detail I didn’t realize until we talked on The Delicious Story, however, is that Mariah is a quintessential fan of coffee shops. And the why behind it is one of many stories we learn about Mariah Jade in this episode. It turns out Mariah spends loads of time in coffee shops, both in the States and in her other home in Mexicali, Mexico. For those fellow artists, you may already realize the symbiotic relationship between artists and coffee, but I didn’t get the connection right off. Mariah does have preferences when it comes to the independent shops here in Des Moines, Iowa. She frequents many and spends hours in them. But one, in particular, is her first and most important coffee shop. You’ll discover why the unassuming location at the corner of 42nd and University stands out for her. For this episode of The Delicious Story, we are nestled in the coffee shop at our local Barne’s and Nobel in West Des Moines, where Mariah’s artwork is currently on display. Mariah’s art on display at a local coffee shop. To be clear, we did not discuss coffee, specifically—the flavors and roasts—but talked instead about the significance of the brick-and-mortar locations themselves. These are spaces where so many of us set up and work in our office-away-from-home. And with how busy these spaces tend to be, day and night, I’m sure many of us wonder where we ever hung out before coffee shops came along. A quick internet dig brought up an article by Sean Paajanen on The Spruce Eats. He takes us on a quick tour with highlights of how we came to this point in our coffee shop-filled world. It all started with abandoned bags of coffee left by the Turks, who fled a conflict in Vienna in the 1400s. Those bags were the impetus for the Europeans to adopt the beverage and spend the next couple hundred years integrating it throughout their daily norms. Fast forward to 1946 when someone named Gaggia invented the first espresso piston machine, which upped the game for coffee and the variety of options to enjoy it. No longer just a beverage served at coffee houses with a primary focus of food (think diner), coffee shops became a thing for every time of day, and modern coffee connoisseurs were born. The first Starbucks opened on the West Coast in 1971, and from there the expansion of coffee shops, particularly independent shops, across the U.S. continued. Des Moines saw our first independent shop in about 1993 when Zanzibar’s Coffee Adventure opened on Ingersoll. It’s hard to imagine where we’d meet and often work if it weren’t for coffee shops today. For Mariah, the coffee shop space is where she does a great deal of her preparation, considering her next art projects and managing the marketing piece of her business required to keep her art in front of the public. After completing high school, Mariah took a bold step to channel all her skills and knowledge into becoming an artist. Deciding to be a working artist is not for the faint of heart, it’s true. An artist has to love what they do AND be business savvy to earn an income. You’ll learn how Mariah has worked to do all of this, as well as her preferred mediums for the pieces she creates in this Delicious Story show. From art, we delve into talking coffee shops and how Mariah splits her life between Des Moines and Mexicali, Mexico. Mariah provides a sense of the energy of a border city and how blurry the experience can be in these communities that line the U.S. and Mexico. I ask Mariah to share her family story, which turns out to be one of both courage and immense love. You’ll hear from Mariah how she and her husband had to make tough decisions, which were even more difficult in the current climate of immigration in our country today. All of these thoughts of borders gives me pause to reflect on the small worlds where we dwell in our everyday life—the places we call home. For me, that has been the radius of about 10-miles from my house in Des Moines, Iowa for more than 40 years. It is comforting to head to the local haunts and coffee shops nearby and sit amongst the people I casually know, where I feel deeply connected. We hang out together at our separate tables with the clattering cups, the clang and whoosh of the espresso machine underscoring our conversations or work. However, there is a universality of the coffee shop experience that has no boundaries. Whether the shop is in the Midwest, the West Coast or in another country such as Mexico, the components of the espresso machine and hum of conversation are much the same. We can feel a sense of home because the experience is similar no matter where we happen to be. Mariah knows this first hand because she has chosen a life where part of her time is in Des Moines and the other part in Mexicali to be with her husband. The day will come when they can move between the two countries together. And when that happens, they’ll enjoy the truest representation of home in being with the people they love most. Until then, and onward after the fact, Mariah will be creating art and sharing it with her expanding audience.